First, I want to point out, with some rather vain satisfaction, that I covered the crack 150 miles east of the east rim of the Yellowstone caldera on October 29 (pun was totally by accident). The main line media has made no mention of this event as far as I can learn. Now, after over a month from when it happened, Drudge posts it, and the article he linked to was published on October 31. It is a LONG time after the event to call this "news." My \source posted it on October 28.
but "experts" know best of course. Matt Drudge likes to talk about himself as bold and unencumbered by outside influence. Well, why did he wait so long to cover this? I suspect he was inhaling the government official response to the crack, that is, water erosion. Check out the photo at the top right. There is no water in sight. This tells me something serious is happening. Why? The gurus of science and government are lying. Why lie? Simply this-- water could run down the two draws at either end of the crack. How could water run up and over the rocky hill and erode it away? Furthermore; water erosion does not leave pillars of dirt strewn about in the middle of the eroded area. Such pillars exist in Grand Canyon, but they are solid rock. These government agencies need to vet their liars better. That hill moved seriously and suddenly. Water had nothing to do with it, and the presence of an extremely active volcano and deep seismic activity, has to be about 90% the possible reason. Also, there is no report that anyone is watching to see if the ground is rising in this area. So, please bring up this Google Map in another tab. You will see on the map that the Bighorn Mountains (and Ten Sleep) are about 150 miles from the east rim (Shoshone Mountains) of the Yellowstone volcanic caldera. 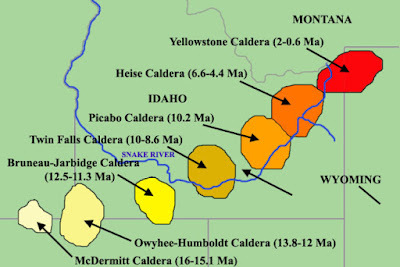 The map below shows that the calderas are around 150 miles apart, and the Yellowstone Caldera seems to be redirected to the east more. This points the way directly at the crack in the earth in the Big Horn area. This October 30 earthquake report is typical. These mini earthquakes are happening by the hundreds all the time. There is seismic activity under Yellowstone which indicates that the earth is in perpetual motion and very active. Also, Yellowstone Calder has been rising 3 inches per year, a great increase in recent years. The movement is thought to be toward the east, and when the next caldera erupts, it is thought it will be to the east of the last eruption, like right where the rip in the earth is. The dating here is 100% evolutionist. If the earth is maximum 10,000 years old, all of these numbers have to be seriously factored down. Thus, a super eruption is very possible any time. This man does good work, but he is working with US Government reporting which is very likely doctored to calm the masses and the asses. Also, did they do all this testing under the Big Horn Mountains? If they did, they probably will not tell us. As to the in-earth mapping techniques of the government research, that is dependent on technology, and we all know there is always an "Ooops" factor in this. They are always telling us, "We have just discovered a new technique we can use to study this and that, and this and that are not at all what we first thought." They then go on to tell a glorious story of discovery, featured on the Discovery (cover up) Channel, that completely erases from our minds the fact that they were dead wrong up front. I like to call this the Columbus Effect. People in Europe thought that Christobal Colombo, in 1492, thought he had discovered America. What he discovered was some islands in the Caribbean. Ooops- write a news release about our new method of finding the New World. 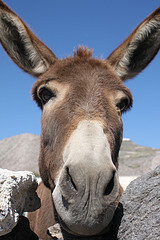 They interview "experts" who admit that all this volcanic science is very uncertain. Remember, most of these 7 volcanoes created a mountain. The Yellowstone super beast was so violent that it blew out all the ejecta which left nothing to make a mountain. That is what a caldera is- a tombstone to the largest beasts on earth. Each of these volcanoes have a halo of collapsed space around them. This is the meaning of caldera, as in cauldron. I must say, as I got to number 7 in the list, my blood ran cold. I live right on downwind from Yellowstone in Texas. All we need is to have a blast during an Alberta Clipper, and most life between Yellowstone and me would be snuffed quickly, but if I were still alive, I would have the unbelievable task of doing only two things-- 1) Find water to drink, and 2) see how quickly I could grow something to eat. So, to you who believe you are ready to survive anything, what are you thinking now? 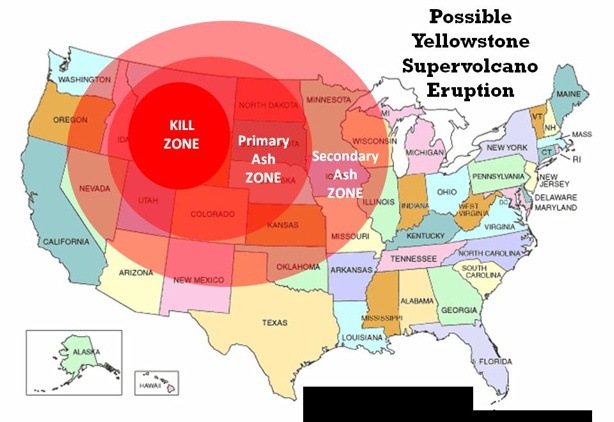 God can push the red button in Heaven marked, "Yellowstone," and destroy the USA as we now know it? I mean, does he actually have your permission to do what glorifies him? Someone should send the URL of this blog post to their Senator, and to Barak Obama. Ask them, "What is 'exceptional' about a nation covered with volcanic ash?" Finally, I make no claim to see down the road as to such potential disasters. What I do claim is that the official news sources, and Big Media, would absolutely not tell us if they knew a super volcano was about to erupt. They would all flee the country, along with their cash, and leave us to fend for ourselves. I have no confidence in ANY US Government agencies which our tax dollars fund to look after our interests. So, start surfing the web in the far corners better, and then make your own conclusions. This is NOT being covered truthfully by the media. We are not supposed to know this, and that means it is very significant. The point is, this is new activity, and it is not just a little spit up like Old Faithful. Sorry about the narrator's potty mouth. It seems that our culture today allows filthy mouthed response for anything shocking or mysterious. This is another good reason for God to blow Yellowstone. It might put the fear of God back into some slobs. What does that mean? The "experts" tell us that the flow upward is stopped by dikes of solid rock from solidified lava. The pressure from beneath then breaks the dikes, and the lava keeps flowing upward. The breaking of he dikes causes small earthquakes. While the molten lava comes flowing up from inside the earth for over 600 miles minimum, a mile from the surface is a very thin barrier between our world and hell. Correction from recent discoveries-- the molten lave is now within a mile of the surface. HERE IS NOW HE NBC PEACOCK WARPS THE STORY ON NOVEMBER 2! This is the perfect example of slow reporting made to sound like it just happened. Again, may I humbly point out, I beat NBC and Drudge to this one by four days. What is the point? The point is, ALTERNATE MEDIA is something YOU have to find. Stop assuming Alex Jones, or even I, can find it all for you. The smart people do their own surfing of he world. Why this one is left out of consideration is probably because it is too remote to give attention to. It is considered "inactive," but to is a sleeping tiger. The extreme size of this caldera seems to me to call for more exploration.